So like a lot of ConfigMgr Admins out there I strive to produce the fastest and most robust task sequences I can. This obviously led me down the path of configuring the Power Settings on the OS during deployment and capture phases. 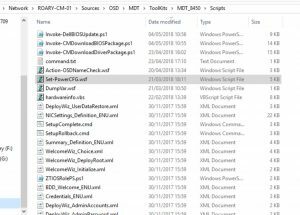 The issue that I found is probably like many of you have and that is that it requires exporting the native “PowerCFG.exe” from each version of the OS that you would like to dynamically change the power configuration during Operating System Deployment. So Jack and I were discussing why… in short… do we not use the “PowerCFG.exe” that is is already in the OS that we are configuring. Anyway after a little persuasion we came up with this little beauty of a script. This script will also create a CMTrace “Log” using its name in the Log folder that is currently in use in the Task sequence. Once inside the scripts folder copy the “Set-PowerCFG.wsf” into it. Create a new “Run Command Line Step” and add one of the below commands.
' // Requirements: ZTIUtility.vbs Must be located in the same folder id running from ConfigMGR.
' 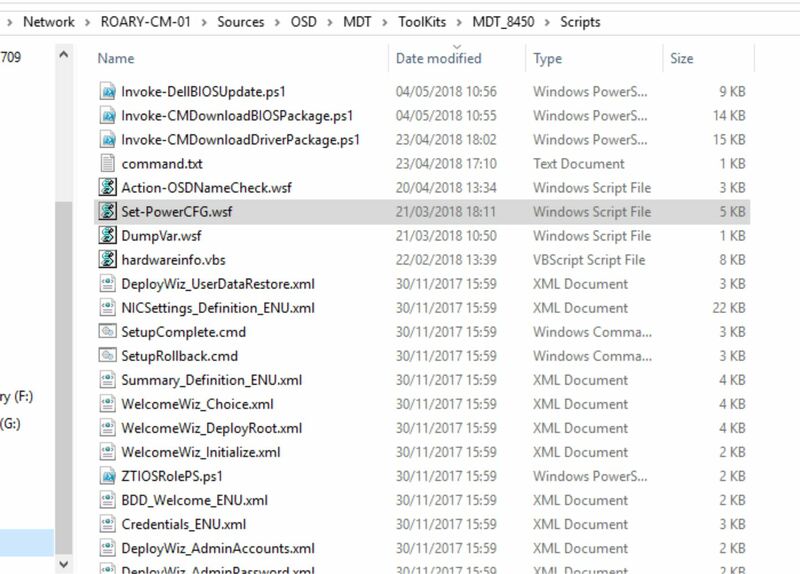 // Purpose: Script sets power profile during OS deployment - Can be run in WinPE or full OS. Dim strPwrBalanced	: strPwrBalanced	= "381b4222-f694-41f0-9685-ff5bb260df2e"
Dim strPwrHighPerf	: strPwrHighPerf	= "8c5e7fda-e8bf-4a96-9a85-a6e23a8c635c"
Dim strPwrCFGexe	: strPwrCFGexe	= "powercfg.exe"
Dim strPwrCFGswitch : strPwrCFGswitch	= " /S "
Dim strPwrCFGFolder : strPwrCFGFolder	= "PowerCFG"
Dim strWmessage	: strWmessage	= "Please enter one or more arguments 'E.G : /High for High Performance Profile' or '/Bal for Balanced Profile'"
Dim strSysWow64	: strSysWow64	= "SysWOW64"
Dim strSystem32	: strSystem32	= "System32"
'Get OS Arch and set folder to run powerCFG from. Thank you for this. Now you say that this will work whether in WinPE or Windows, but if I recall, there is no powercfg.exe in WinPE. At what points in the task sequence should be be executed for best results. Does this need to enabled again after each reboot or will it hold the settings until its set back later in the task. As WinPE does not hold changes on reboot, if you are rebooting, for example BIOS upgrades or BIOS to UEFI, then it must be rerun after every reboot. The next stage would be after the ConfigMgr Client setup task. But remember this can also be used while capturing the image (MDT), this will mean that the image is captured in High performance mode and during the Windows setup phase (Setting up devices) this will also run in high performance mode as this portion is set to balanced by default.